We all had that one faithful pasta dish we all loved as kids, it was creamy, cheesy and most important familiar. Familiar was important because we weren’t exactly adventurous when it came to food. 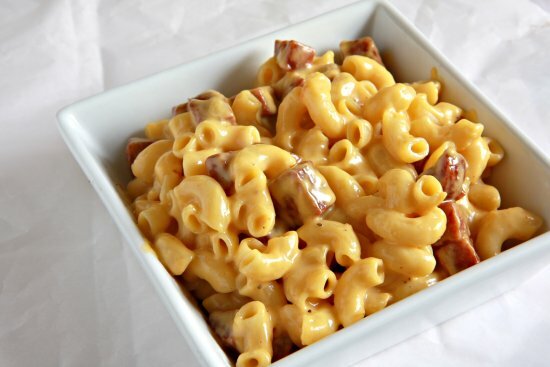 For a quick lunch my mother would pull out that friendly blue box of mac n’ cheese and some hot dogs. 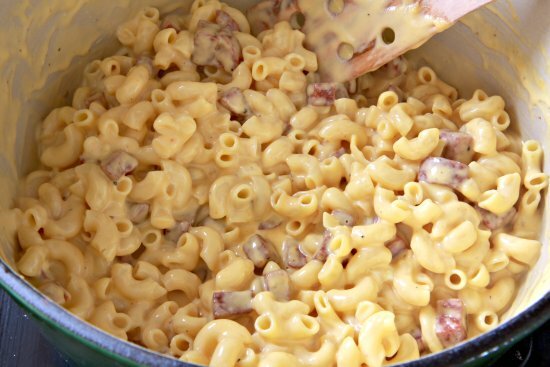 😀 There was nothing like a big bowl of creamy mac n’ cheese with some pan fried hot dogs. 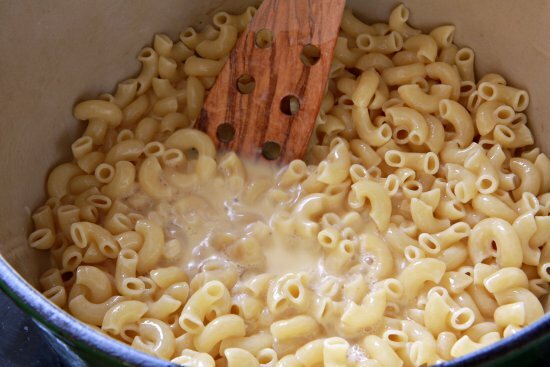 Mac n’ cheese was faithful to us through childhood, collage and even when we were first out in the world on our own and broke. 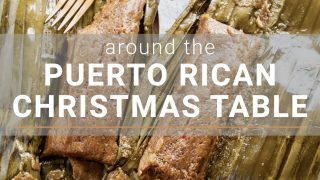 It was cheap, easy and darn good to eat! 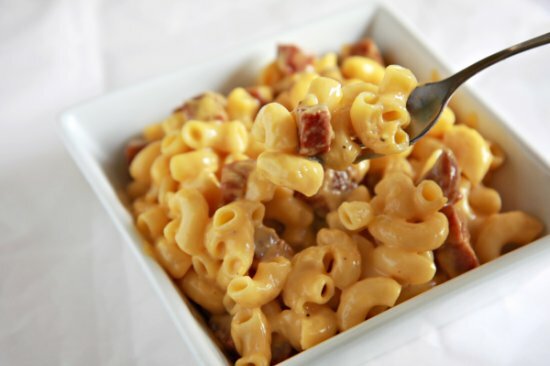 This is a little bit of a grown up twist on the creamy stove top mac n’ cheese. I saw this recently on Good Eats and I had to try it ASAP! Is it exactly like the ol’faithful blue box? No, but it is pretty close and darn good to eat! T he sauce is of course cheesy and it sort of the texture of a creamed ricotta. Regardless it’s soft, creamy, cheesy and delicious. Dice up your sausage of choice or hot dog, no one here will judge you. 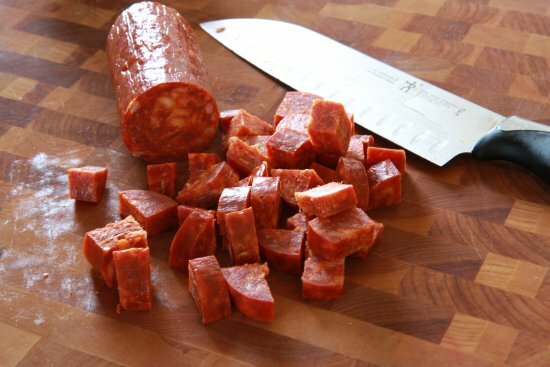 I chose chorizo because I love the hint of spiciness you get from a chorizo. 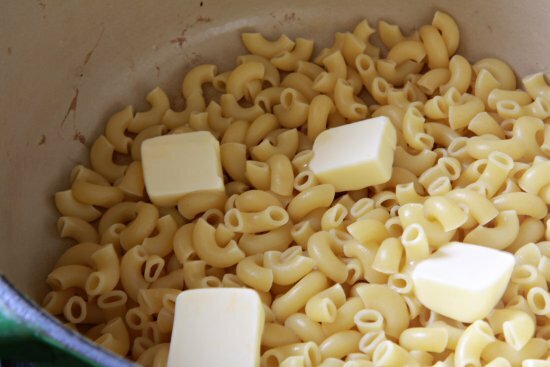 Boil your macaroni in salted water until al dente, drain the pasta and return to the pot, add butter and toss at low heat, until the butter is melted and the pasta is evenly coated. 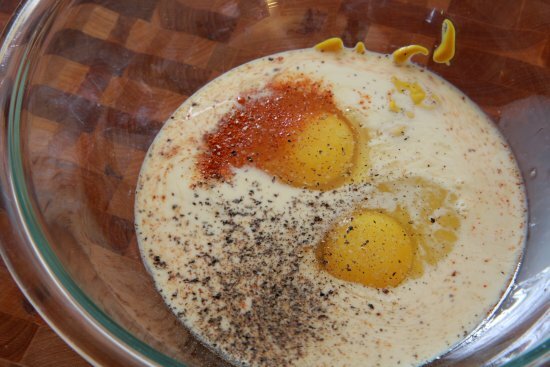 In a separate bowl whisk together evaporated milk, eggs, mustard, cayenne pepper, salt and fresh ground black pepper. Add shredded cheddar and stir. Using a slotted spoon add your sausage into the pasta. Stir together on low heat for about 3 minutes or until creamy. Serve yourself a big heaping bowl and sit down and watch your favorite cartoon. Because that is what you did when you were a kid right? 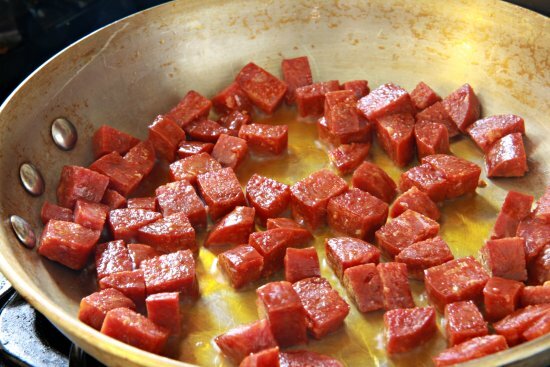 Dice sausage into cubes and pan fry until toasted and browned, set aside. Whisk together the eggs, milk, hot sauce, salt, pepper, and mustard. Stir into the pasta and add the cheese. Using a slotted spoon transfer sausage in with pasta. Over low heat continue to stir for 3 minutes or until creamy. made this tonight, it was a big hit. real comfort food kind of meal. i added some sriracha to the milk mixture to give the dish an extra kick. i did about 6 onces sharp cheddar and 4 onces smoked gouda. came out really rich and tastey. it’s awesome on it’s own, especially served with a nutty multi grain or oat bread with a nice thick crust. but i think next time i make it will be as a side to bbq chicken and roasted rosemary potato’s. or after a light green apple and mixed greens salad. This recipie looks so delicious! Great looking photo too. It looks so creamy! 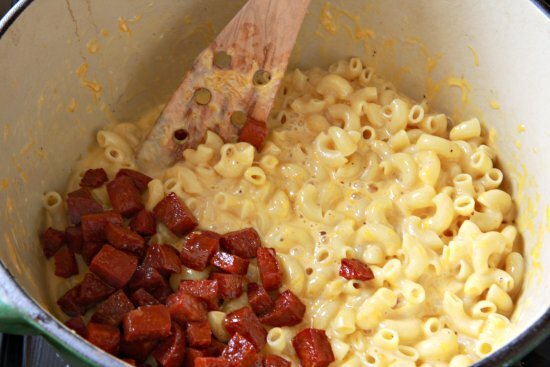 I generally don’t like mac and cheese, but chorizo constantly calls my name. Might have to try this! 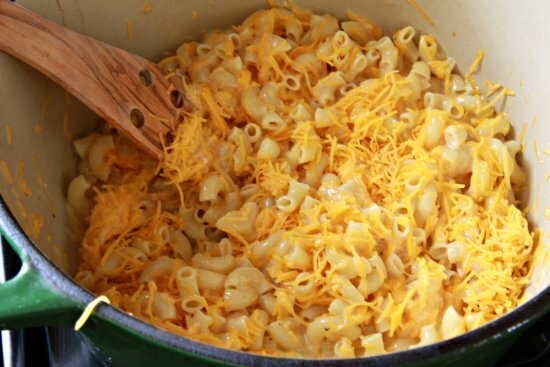 Thank you for such a wonderful Mac and cheese recipe, I would have never thought of trying evaporated milk in the Mac & Cheese but I must say it works !!. My daughter will have this tonight as soon as she comes home from her college classes.